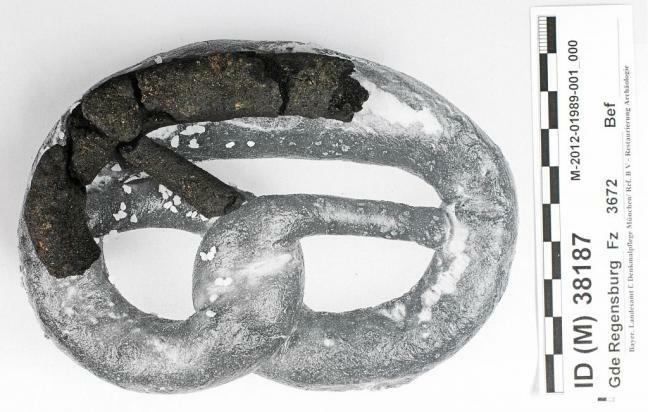 Archaeologists and carb lovers are excited over a recent find in Bavaria, where scientists unearthed a 250-year-old pretzel, still in pretty good shape — all because whoever made it biffed in the kitchen, burning the pretzel during the baking process. Dubbing it the oldest pretzel in the world, archaeologists dug up the bit of burned dough along with several rolls and croissant-shaped dough during excavations in Regensburg, Germany, reports NBC News. Carbon dating shows that the food was made sometime between 1700 and 1800, and have survived until today due to bad baking technique. The mayor is psyched about the aged dough, because everyone loves pretzels. “This discovery is really extraordinary, because it depicts a snippet of everyday life,” Mayor Joachim Wolbergs told The Local. I’m willing to bet at least one of those archaeologists was like, “Hey… dare ya to take a bite.” But clearly that would only happen if cheese sauce was available. You know, to cover that burned taste. Next Will Congress Try To Kill The Consumer Financial Protection Bureau? Next Up: Will Congress Try To Kill The Consumer Financial Protection Bureau?